"WordPress" Reviews (Apr 2019) - Why 5.0 Stars? Powering more than a quarter of the websites online today, WordPress remains a trusted and robust platform for designing, launching, and managing your web presence. It's the software I recommend to first-timers and veterans, and whether you're looking for a shared, virtual, or dedicated server, you can count on InMotion to host your WordPress site. “WordPress, the #1 blogging platform and software that powers more than 26% of websites currently online, needs no introduction. The underlying software of WordPress.com, a browser-based website builder for newbie site owners to stretch their website design wings, can be downloaded and installed for free via WordPress.org. “WordPress hosting is incredibly cost-competitive. The software itself is free, and most shared hosts offer WordPress packages in the $2- to $5-per-month ballpark. It's easy to get started, as hosts will often offer single-click installations for WordPress, and then you can begin browsing the thousands of themes available in the Appearance section of the WordPress dashboard. Customize to your heart's desire, click "Publish," and voila! You've got yourself a self-hosted WordPress website. “If you're a mid-sized to large-scale online business, or if security and compliance are of utmost concern, you may be considering a dedicated server for your hosting needs. Dedicated resources come at a premium, but leading WordPress host InMotion makes it worth your while. “Virtual private servers yield the utmost flexibility at a cost-effective price point. Some of the most performant and popular websites in the world are powered by VPS hosting, and the same can be said of the WordPress platform. From the New York Post and Fortune.com to Spotify and Beyonce.com, millions of websites run on WordPress. HostingAdvice is backed by a virtual server and managed via the WordPress platform. It's a match made in hosting heaven. “Good news, website owners: The software that powers upward of 25% of websites is free and open for public enjoyment and customization! WordPress is ready for download at WordPress.org, and the team is actively maintaining its core code. So long as you stay current with your WP software versions and install plugins with caution, the site-building possibilities and benefits of WordPress are seemingly endless. “While WordPress is technically blogging software, it's been called a website builder, a content management system, and even an eCommerce platform — basically, a website-building multitool. Because it's open-sourced, the core code can be adapted to meet virtually any website need, and the wealth of plugins and WP-friendly apps built by third-party developers makes this platform a go-to for website owners around the world. WordPress remains the #1 platform for blogging, but the software has been bastardized into a content management system, lumped in with the likes of Joomla and Drupal and used to maintain virtually any type of web content. Trusted by some of the web's most famous sites, WordPress can be used to create blogs, vlogs, online stores, and professional or personal-use websites of any scale. Once you get to know the backend environment, WordPress lets you quickly and intuitively draft and publish posts, pages, menus, and headers. Anything can be customized via the sidebar — from user permissions to theme settings. Typically, we review hosting options based on storage, uptime rates, bandwidth, and support, as well as cost and design features. It's important to note that WordPress software is a self-hosted option, meaning you can download the software for free, but you have to pay for the hosting benefits of a third-party provider. Fortunately, many of the best web hosts make WordPress readily available with single-click installations of the software. InMotion will even install WordPress for you at checkout. By partnering with a WP-savvy host, you can benefit from up to unlimited disk space, a free domain for your new site, and assistance with migration, WP updates, and server monitoring. 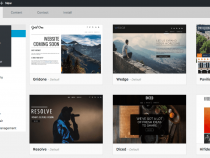 Thousands of free and premium themes are available at WordPress.org, as well as third-party sites, to help non-coders create a professional-looking online presence. BoldGrid, a one-of-a-kind, drag-and-drop design tool built by the InMotion team, puts a WYSIWYG twist on the legacy WordPress environment for easy site design and deployment. If there's something you'd like to finagle, and you can't figure out how to do so within the WordPress backend, chances are there's a plugin for that! By integrating leading apps and scripts, such as Shopify, Woocommerce, and PayPal, your website or blog can be transformed into a fully functioning online store. The WordPress platform is built and maintained by the WordPress.org team and is completely open-sourced, meaning users can customize it any way they like. More than 30 experienced developers actively work on updating and maintaining the WordPress Core code, but hundreds of thousands of webmasters and dev folks work with the software on a daily basis and have contributed their expertise in forums and FAQs. While open-source has its disadvantages, including susceptibility to security vulnerabilities (mostly caused by human error), the pros far outweigh the cons. Take advantage of the wealth of WP programming knowledge found online and through your web host. The ease of use of the WordPress backend is a controversial topic. Some accuse the software of a steep learning curve, while others praise it for its intuitiveness and wealth of resources for newcomers. Our takeaway: As with anything else, if it's worth it, you'll put in the time to make it happen. 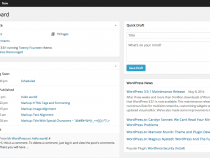 The WordPress platform's functionality potential is seemingly limitless. You just have to befriend the interface and its quirks. WordPress boasts the most attractive price tag there is: FREE. The software that needs no introduction can be found at WordPress.org, downloaded, and installed for $0. HOWEVER, you do have to pay for some sort of hosting if you want the website you design using WordPress to ever see the light of the virtual day. For the best value in WordPress hosting, we recommend InMotion Hosting plans. For less than $5 per month, the InMotion hosting team will install the software, help you migrate an existing WordPress site to InMotion servers, and back up your new site automatically. You benefit from SSD speed, 99.99% uptime, and ultra-reliable support for a monthly fee that's less than the cost of your daily latte. Typically, the verdict of this section boils down to the reliability of the hardware and the support of the team. Since this is software we're talking about, WordPress puts a spin on this review round. The WordPress platform itself is very reliable, though the open-sourced code puts the software at risk of falling prey to bugs and other holes in security. For the most part, it's user error that's to blame. When things go wrong for a WordPress site, nine times out of 10 it's due to one of two things: The site owner didn't update the WordPress Core regularly or a buggy plugin got in the way. Keep your software versions current and only download plugins from credible sources (read the reviews! ), and you should be golden. For everything else, there's your hosting provider. InMotion Hosting touts some of the best support in the world, with around-the-clock security monitoring, automatic site backups, and a 99.99% uptime guarantee to ensure your WordPress site is protected and almost always online. Wondering how WordPress stacks up againt other web hosting services? See our host-vs-host reviews below and compare them side by side. 10 out of 11 times. Trusted by millions of web novices and veterans around the world, WordPress remains my #1 recommendation if you're looking for a comprehensive platform to build, customize, and maintain a stellar website. With the software preinstalled for you at checkout, InMotion Hosting ushers customers into the wonderful world of WordPress web hosting with utmost confidence and 99.99% uptime guaranteed. If you're new to the WordPress interface, we recommend employing InMotion's BoldGrid, the drag-and-drop site-building platform that sits atop WordPress, bringing WYSIWYG simplicity to ease the WP learning curve.